Is DJ Hero 2 best played as a battle? Last week I played DJ Hero against someone. I had never done this in 2009 using the first DJ Hero game, but I was in the Activision demo area at E3 and the people making this fall's DJ Hero 2 had two turntables set up. Two DJ Hero turntables in one room? The set-up Activision wants us to have? I didn't know when this combination of peripherals and me was going to happen again — who has two turntable controllers? — so I had to try it. I was on one turntable; another E3 attendee was on the other. We each had cascading note highways to follow, displayed on the big TV in front of us. As was the case with DJ Hero 1, my competitor and I had to scratch, jostle the turntable's cross-fader and press the proper turntable buttons in time with the notes streaming down the TV. We were playing a mellow mode that allowed us to set ourselves at different difficulty levels. That didn't mean we couldn't still compete. At key moments, we would get a prompt for a sequence that only one of us would be able to play — the other player, the slower-to-react player would be locked out. That blocking move is just the beginning of how you compete. In a bona fide DJ Hero 2 battle, you also have to rack up points, building up a meter filled representing your advantage over your competitor (that's the blue and orange stack of blocks in the center of the above screenshot). The battling felt like a more interesting way to play DJ Hero, something that can give the turntable series a shot at the party popularity that fueled Rock Band and the band versions of Guitar Hero — if people have two turntables under one roof, of course. 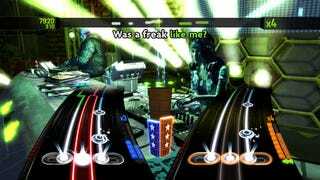 As with the original, DJ Hero 2 will include a soundtrack full of mash-ups, two popular songs mixed with each other. I don't remember it being a feature in the first game, so I was delighted to hear from one of the game's designers that DJ Hero 2 will sometimes let players DJ a mixed track that contains two full tracks. That means you can mix, via cross-fader however you much you want, instead of merely following a pre-cooked mix. The new game will also include song-specific squawks, for those who felt that having Flavor Flav yell over just about any track in DJ Hero 1 didn't fit the mood. DJ Hero 2 will be out this fall for all major gaming consoles. Can you be compelled to pick up your first — or second — video game turntable?